What do you do when your web hosting company struggles to get your server back online and healthy? These last couple of days have been pretty frustrating, but if you’re reading this, at least the server is operational at the moment and hopefully they’ve resolved the issue. It’s so aggravating when there’s nothing you can do about a problem except wait for someone else to fix it, but the server downtime did give me the chance to look through some old photos and discover one reason why we love dogs so much. 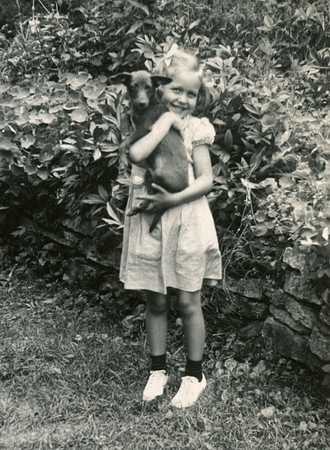 I love vintage photos and while browsing through some images of my family, I was surprised at how many pictures my parents, grandparents and even great-grandparents had taken with their dogs. 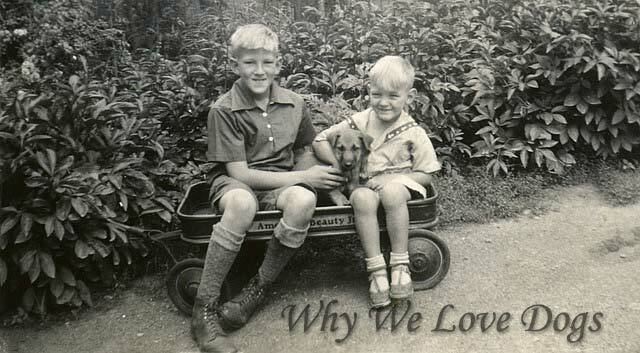 It was interesting to discover just how much they loved their family pets and I guess they passed their love of dogs down to me as well. Maybe it’s one of the biggest reasons why we love dogs; it’s in our genes! Here are a few of my favorite family and fido pics! Aren’t these adorable? Kids and puppies are the best and these kids just happen to be my mom and dad. 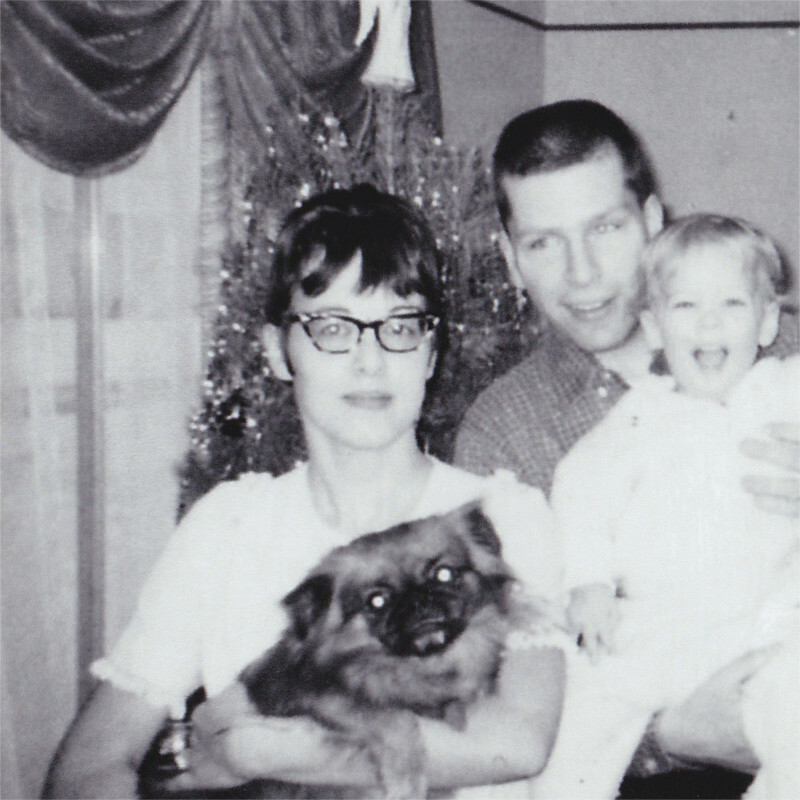 Mom and Dad as young teens still looked very devoted to their pups. 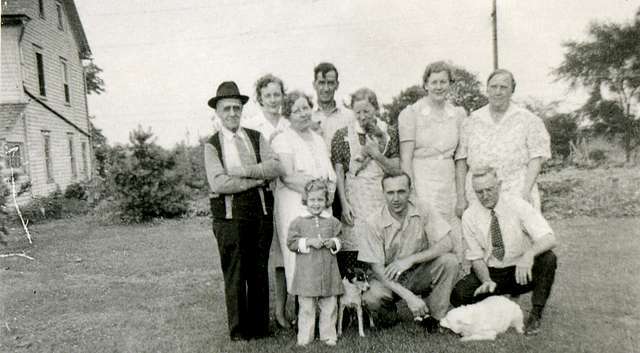 I love this photo with four generations of my mom’s family along with a few of their dogs and the family cat. 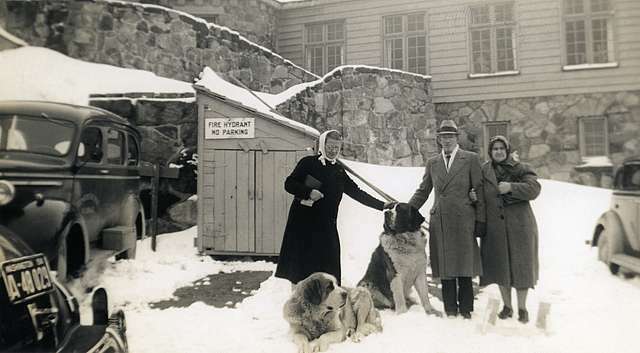 Here are my dad’s grandparents giving some love to a pair of St. Bernards while on vacation. 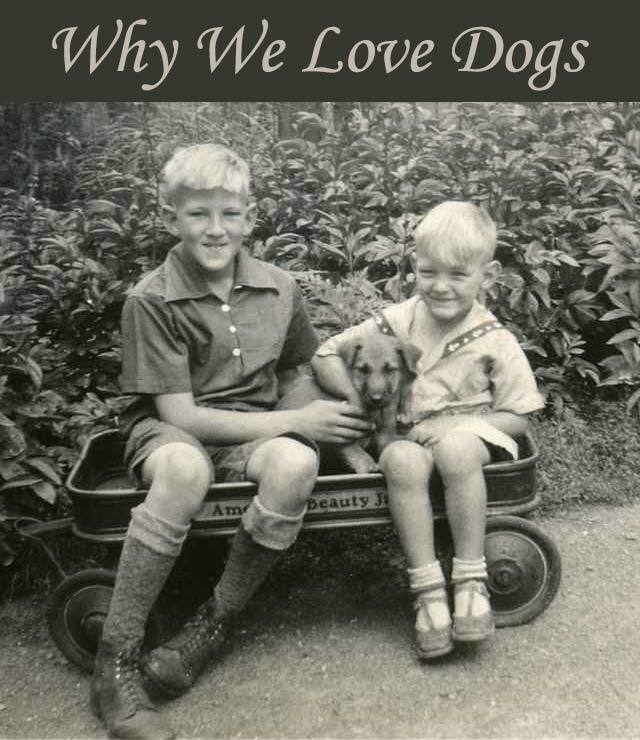 Did you inherit your love of dogs from your family? You don’t have to wait for unscheduled downtime by a web hosting company in order to drag out that box of old family photos. Take a look today and share your favorite image of family members with their pups by uploading a photo in the comment section! We had big server issues in June, paws crossed they stay resolved! My mom loves all the old photos and stories. She sometimes feels like she is the odd one in the family as she is the only one who runs, walks, it real into fitness, and the only one with a dog, but who cares. We are happy. That makes you and your gang very special family members, Emma! ? Oh my, those are such great photos! It is so interesting to see all the generations and the different dogs they had. I’m so happy to have these old photos, they’re fascinating to look at and I was surprised to see so many dogs. Awesome! We had server issues for almost 48 hours once, thought I was going to die. Hated the inability to blog. Welcome back! I truly adore all your vintage photos. They are in pristine condition, you are blessed to have them. Thanks so much for sharing them with us. Thanks, Cathy! It’s great to be back after a rough couple of days. ? UGH! Sorry to hear about your web issues!! That is so annoying! Love these old time photos though!! YES, especially when all they say is “We’re working on it but have no idea when it might be fixed”. It was nice though to take advantage of the downtime by doing something fun and finding these pics. This is a wonderful post! You have such great pictures of your family! 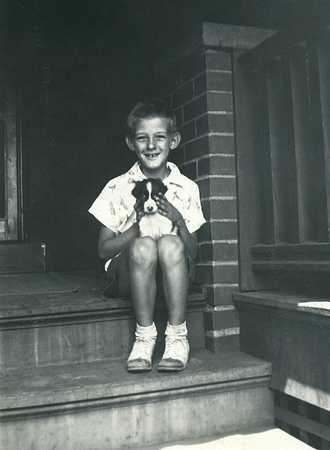 I’ve always said one of the best things my parents ever did for me was to instill a love of animals in me as a child. Aw, thank you Taryn! I’m glad you had parents that gave you that gift. It really shines through in your wonderful blog posts. So sorry to hear about gremlins attacking your server. It’s never fun. And we become so dependent on these things. But I loved that you made the best use of your time. It’s amazing that you found so many pictures with pets in your family. I don’t think I’ve ever seen animals in my family pictures except for my very own. You’re certainly making up for the pup photos in your family, Pamela. You’ve got so many wonderful images of you, Mike and Honey and the sweet dogs you had in your life before Honey. Your images always bring a smile to my face. ? Thanks so much and I agree, dogs rule! ? Yuck, server issues. Yay it’s finally ok. I have always had a heart for dogs. There is something amazing and wonderful and life changing about loving and being loved by a dog!! They truly make our lives whole, don’t they? Thanks for stopping by today, Julie! ? You inherited a love of dogs. I love old dog pics. This is me and my bro with my grandparents’ dog, Schatzi. Pretty sure that was the first dog I knew. Whoa. I didn’t know that would post so big! It’s perfect, Kari! What a cute picture of you and your brother with Schatzi. I love the way Schatzi’s looking at you, he must have been a very loving dog. Thanks for uploading your pic! ? Great photos! 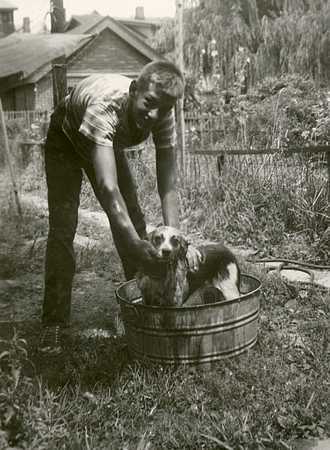 I love old photos with dogs. Both the hubs and I have some. I was definitely born into a dog loving family! I’d love to see a few of those old photos, Jackie! If you get a chance, upload and share them with us. ? What wonderful pictures. I recently looked at some old pictures of my son growing up and nearly every photo included one of our pets as well. That says a lot about how much you and your family love your pets and what better trait to pass along to the next generation. ? It sounds like you have wonderful parents, Kaitlin. Allowing a child to love and care for an animal is such a tremendous gift that has so many positive benefits. Isn’t it fun looking at all the details, like the old cars and fashion? I wish we could magically transport ourselves into those moments to visit with relatives and see what life was like back then. Hopefully we’ll see a post one day soon of your old photos and maybe a few family dogs too! You know what they say, a picture is worth a thousand words! Thank you so much for sharing! I’m glad you liked the vintage photos. Thanks for checking out the post today! Mom’s always had dogs all her life. I heard her talking about it. She has me and I know she’s a dog lover. And she’s a dog trainer too so she must really love dogs. I just don’t like it when I smell other dogs on her close when she comes home. I sniff her so much it makes her clothes wet. Haha! That’s a lot of sniffing Mary, but I can imagine there’s lots of interesting scents of the dogs your mom works with all day. I would say you’re one lucky dog! Thanks for sharing that adorable photo, Camille! What a gorgeous family and Bea does look awfully sweet. I just love that huge smile on your face. ? Wow, these are amazing photos! You’re so lucky, you will have these photos to cherish forever. I wish I had photos like that but I have so few photos with family pets. I didn’t inherit my love of animals from my parents; they were New York City born & raised living in small apartments when they were young. I grew up in the suburbs of Long Island. We lived next to a large wooded area, and that’s how I developed a love of nature and animals, by spending so much time in the woods! I bet you have great memories of spending time in the woods. I’m not sure how many kids do that these days, but me and my siblings and all the neighborhood kids spent much of our time exploring the woods and nature around our house too. Great photos – I love looking at oldie like these. The old photos are so fascinating, like looking at your parents in an episode of Mad Men, lol! Those are such beautiful photos, and the wide variety of dogs themselves is quite impressive. And St. Bernards – seriously how cool is that? It’s interesting when you think back about the first dog you remember. 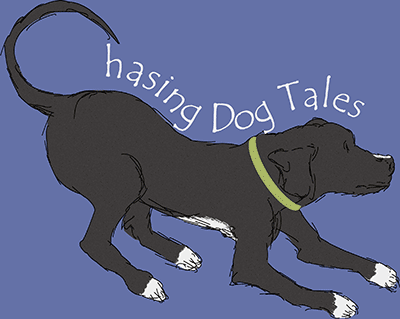 Maybe you were too young to remember your parent’s dog but it’s fun to recall our early experiences with pets. 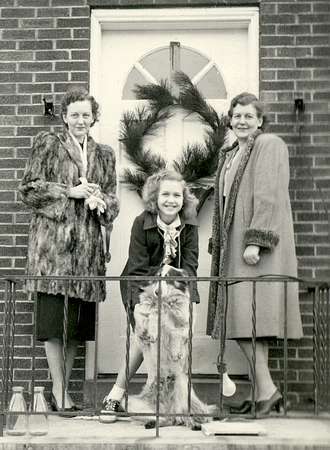 Great photos – love seeing the generations with their dogs. My momma had a couple of dogs growing up, but her parents were not much into dogs and thus they were not treated well, neither would their cats. This had a lot to do with the culture. The good news is that momma did not inherit those ideas . Once grown up, her dogs, cats, raccoons have been treated like royalty! I’m so glad that you’re back online! And good for you, using your downtime to do something creative. I probably would have worn the carpet bare with pacing. And what a post to come back with! I love these photos. Thanks, Jean! I’m pretty understanding that issues happen with web hosts occasionally (especially with shared hosting plans), but after you hit the 24 hour mark and counting, it gets pretty frustrating. I guess most of us have had to deal with that at least once though. What great photos! That’s so wonderful that you took a frustrating situation and got such a great post out of it. 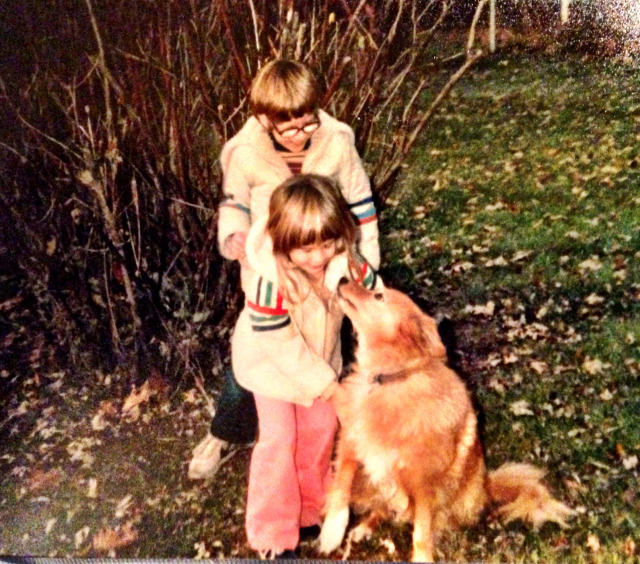 I remember a lot of fond moments from childhood with my family’s dogs. My grandparents always had dogs, we had Poodles, my neighbor raised Rottweilers. I had great variety in the dogs around me. You’ve made me want to go searching for old pictures now! Yes, I would love to see some of your old family photos! They’re so interesting when you look at the details and remember things from the past. I especially think it’s fun to see and remember old kitchen decor and accessories from around the house. It makes me want to start collecting some of those vintage items. My mom loved dogs, I think I did get it from her. Watching how our parents treat dogs (and humans) has a huge impact on us. It’s so endearing to look at old pictures of grandparents, who always seemed so stern growing up, have softened faces as they gaze or pat their pets! They really do shape our beliefs about animals, don’t they? So many of us have been lucky to have parents and grandparents that loved their pups. ? What a sweet post, and how special that you have these photos! Most of my family is pretty dog crazy too. My parents are both dog lovers, so it’s no surprise I must’ve gotten the “dog gene” from them. I have seen many of their old photos with various dogs over the years. My grandma also had dogs on her farm growing up and she was also a huge dog lover. You’ll have to do a post with those old photos too, Lindsay. I’ve seen some pics of your parent’s dogs recently on Instagram and I would love to see some of the older photos. Those are great family photos, thank you for sharing them with us. I love old photos and even more when they have a animal in them. Those are the old images that I really like too. It just adds a little more insight into what people’s lives were like back then. Thanks so much, Teresa! Your site for dog friendly places and events looks really helpful for our canine friends in the UK. ?